Goodbye Chores – Hello Quality Time! As our loved ones age, daily tasks can become challenges or impossibilities. Limited mobility can prevent seniors from being able to clean up spills on the floor, or from taking out the garbage. Normal memory loss can cause seniors to forget to pay bills or take medication. More extreme forms of physical and mental deterioration lead to seniors being able to complete fewer and fewer routine daily living tasks. An assisted living facility can help our aging family members and their caregivers alike say Goodbye to chores and Hello to quality time with their loved ones. If you feel that you and your aging loved one are ready to say Hello to more quality time, it may be time to consider an assisted living center. Download our brochure “Is It Time” at http://www.cityofperkins.net/isittimeforassistedliving. Download or Print: Goodbye Chores - Hello Quality Time! 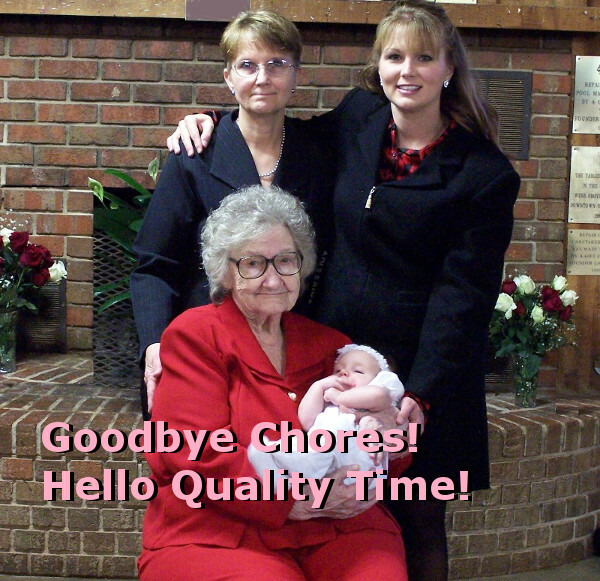 Download our publication, Goodbye Chores - Hello Quality Time!